So recently the buzz around the cloud conventions, vendors, and corporations has been around the utilization of BYOD and user freedom. The challenges many corporations claim is that it is a “security risk”. I was on in agreement with this particular train of thought until I was recently hit with an epiphany: As much as IT hates the idea of losing control, consumerization of the workplace is happening and we either need to get on board or we will eventually be forced down that path. We no longer live in a world that IT tells people what’s best for them; we now live in a world that the user is educated enough and tells IT what they want in order to get the job done in a more productive manner. The problem is is that IT needs to open its ears and start listening and providing the services. It is therefore my great honor to share an idea to the reader. 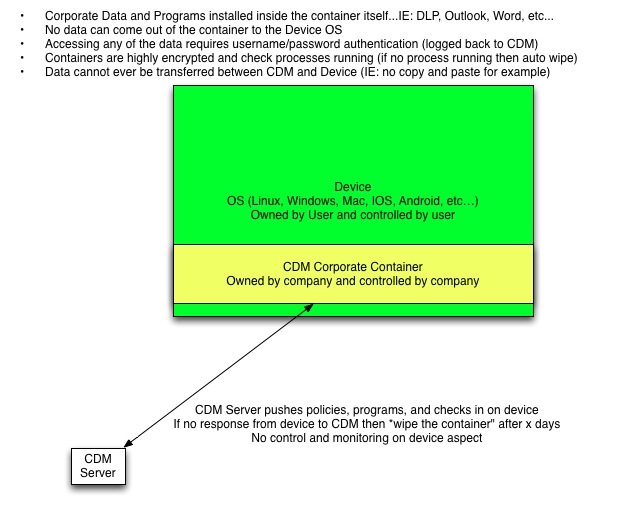 With people utilizing MDM solutions that sandbox mobile data, I will argue that, with time, will see a similar containerization/sandbox environment for Desktop/Laptop Operating Systems. One can argue that with the latest Mountain Lion and Windows 8 releases, we are coming ever closer the merger of Mobile OS to Desktop/Laptop OS Platforms. Todays staff members looks at company time as “their own time”. They have played with cooler technologies than what the workplace can offer. They know exactly what they need to get the job done. The new employee is not going to change so it’s easier for IT to accept the fact and work on coming to a solution that will allow for a more collaborative, productive, happy end staff member. Security will always be a catch up game. As much as we block, intercept, etc…the end user will always, in the end, find a way to bypass it if corporate technology is not allowing them to do their job and in the end security will always be a reactionary follow up. A CDM will offer best of both worlds. It is therefore my opinion to have a corporate policy that encourages CDM style BYOD and gives freedom to the users while also offers a proper sandboxing environments to do it in. It’s the best trade off for both: Finance, IT, Security, and the end user in which everybody wins. However, time and technology, may need to catch up as I write this today.